Many veg families are familiar with author/illustrator Ruby Roth’s first book That’s Why We Don’t Eat Animals, in which the reasons for compassionate eating are assiduously laid out. Ms. Roth’s most recent book, Vegan Is Love, is aimed at a slightly older audience (seven and up) and picks up where her previous book left off. Vegan Is Love delves deeper into making compassionate choices when it comes to our entertainment, personal care products, clothing and food. This book is for children who are ready to hear a few more details (or reminders) about a vegan lifestyle. Vegan Is Love addresses some of our society’s deeply institutionalized aspects of animal exploitation and practices. There are sections about racing, rodeos, hunting, zoos, marine parks and circuses (“We prefer to be entertained by creatures who love to perform,” reads the page of text with the illustration of a human gymnast.). There are also sections on forests, sea life, the benefits of organic growing and a tie in between current standard eating patterns and global hunger. 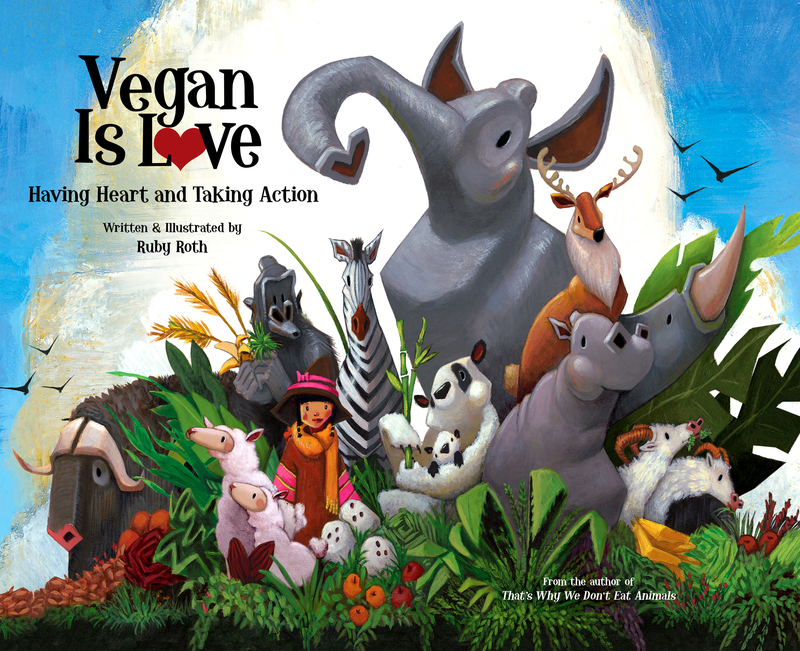 One of the most compelling aspects of this book is that it reminds children that everyone — including kids — can make compassionate, cruelty-free choices each day. The tone is empowering and will sit especially well with children who are motivated to improve their world. Parents, caregivers and teachers who practice or are transitioning to cruelty-free living will relish the fact that there is now another book available that buttresses their values. This book is generating controversy. Many of the concerns being voiced have to do with the fact that Ms. Roth does not shy away from depicting some of the harshest realities of how some animals are treated for food and entertainment. Since this book is candid about the life and fate of many types of animals, it is easy to see that some adults may find this approach to be heavy handed. Though this is is not a lighthearted book, it has an important message. Vegetarian and mixed families may not appreciate the emphasis on veganism, though it is clear that Ms. Roth’s intention was to create a book about the problems with the status quo. Ms. Roth finishes her book with a long list of ways that all of us, no matter what our age, can do to help animals and our planet. Her tips include thoughtful ways to approach shopping, eating, learning, giving and, well, living. For children who are vegan, the book is very validating, which is why many vegan families and friends will feel like this is a great choice for mid-elementary and up aged kids. Fantastic review, my kids are too young for both books but when they are old enough we will check them out. I think that even though all our family’s choices may not always be the most compassionate we still can talk with our kids about the realities of, say, a zoo we visit. I know many veg families would not go to one and there are others that do – there is no way to please everyone with one book. I read reviews of a vegetarian cookbook complaining that it was really vegan, for example! I understand the concerns and criticisms cited – but I don’t agree that our children need to be sheltered. My daughter saw this book in the book store and wanted it because of the elephant’s “heart trunk.” I took a look through it and decided it could be a special occasion book – meaning, I’ll buy it without the kids and look through it on my own to think about how to talk with them about it. The abused animals in the animal testing part, for example, need some thoughtful response. We do visit zoos, and my children do eat some animals. We also use eggs/milk quite a bit. I want them to know the choices we make (farmer’s market, cage free, organic) affect choices the market makes, but I also don’t want them to feel like they are bad if they continue to eat animal products. Basically, I think this is an important book, but one that needs to be read actively with younger children (my oldest is 5) or wait until they are better able to comprehend realities. Thanks for reviewing! As a vegan family living in an insular rural town, Roth’s first book helped our children make vegan choices whilst living in an omni world. It is a beautiful book and tho quite stark, very thought-provoking and helped my boys accept there are people doing what they can to help animals other than us. I love this review, Jennifer, and the comments are even more fascinating. I’m inspired by the fact that parents who are not raising their children exclusively vegan are buying this book and sharing it with their children. What tremendous openness you’re modeling for your children, Kristin! I get that it’s hard to change and that life is a series of trade-offs, but I think you’re right, Homa, that these are conversations we need to be having with our children, even if doing so exposes our own lives to examination. Our copy of Vegan Is Love is supposed to arrive tomorrow, and I wonder if we will find that aspects are challenging to our vegan family. I remember feeling discomfort when I first learned about the dairy and egg industries as an ovo-lacto vegetarian. Getting through that discomfort and making the changes necessary so that I felt no shame about my food choices was one of the most empowering experiences of my life. But veganism is a journey, not a destination, and I still have much to learn about living joyfully and compassionately. Right now, I’m thinking of a book (written for adults) languishing on my bookshelf: The Life You Can Save by Peter Singer. I’ve been ignoring it for fear it may change my life — it is, after all, about forgoing luxuries so that others may simply live. I should pick it up. Love all these books, and very good reviews for parents who want to encourage a vegan lifestyle. Also, did you notice that the last 3 books reviewed have Elephants on the cover? Makes me smile. Jessica, I love so much about what you wrote. For years I avoided videos of animal cruelty because I didn’t want to know about it. I have a lot to learn still but it really doesn’t have to be all or nothing … it is a journey as you’ve said.